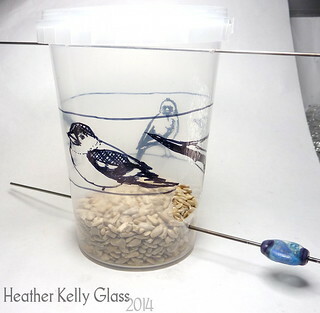 We did a DIY bird feeder challenge for January. All components to be made from things we already had (buying bird feed or fat balls to put in it was allowed, though you can also make your own). 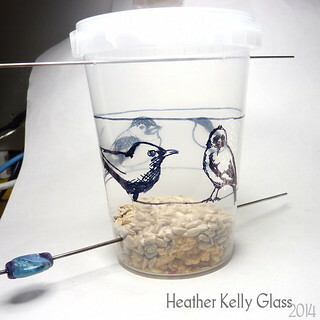 You can see all our entries here: January 2014 Bird Feeding Challenge Poll and vote for your favourite until Thurs 30th. The winner chooses the next challenge! 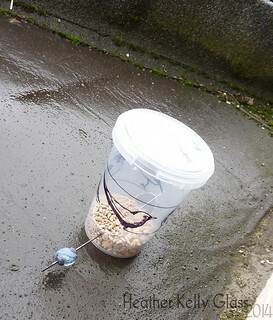 I made this small feeder from a soup container and a couple of old mandrels, one of which has a bead stuck to it. I drew some birdies on it with a Sharpie. The challenge required that you take a photo of it outside, so I grabbed a snap of it sitting out on the balcony. We live in a flat and have no garden, so I was having difficulty finding anything I could reach to attach it to. I have since moved it to outside the upstairs bedroom window, where there is a wrought iron bit on the window ledge. It’s tied to that with stainless steel wire that I put through the holes where the top mandrel was. I’m not sure we’ll get many birds coming to visit, but if they do, they are safe from cats up there. These are so very much not colours that I’d normally wear, but I thought I’d go ahead and see if they grew on me. These were the marble pattern made from the Models Own colours – Luis Lemon, Pukka Purple and Dinky Pinky. I prefer the yellow when it isn’t on top of the blue, because of course it picks up a green tinge then. My favourite is absolutely my pinky nail. I like the colours there and the accidental little heart! I put the decals on over a base colour of the yellow and then Seche Vite topcoat. This decals was rather thick in places, which causes problems at the base of the nail particularly as you get a very noticeable ridge there and this is where any catching of the polish will happen. This is also why my pinkies were my favourites, as they came from a thinner section. I had to rescue a couple of these and reattach them (and of course, adding a second topcoat makes the problem worse). They lasted 6 days before I took them all off, which isn’t bad. These decals were again made on the 30th Dec, and put on on the 19th Jan. It *was* getting brittle by this point. 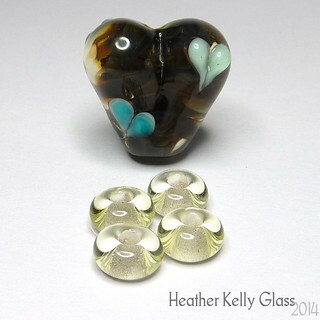 I ended up with quite a few little broken off pieces, which you can use as a confetti decoration placing just a couple over a base colour – it looks a little different that way. I did try going round the edges with acetone to melt them down slightly, but that’s a mistake when the backing isn’t clear because the purple especially gets smeared out and muddy along the edges if you do that. Never mind! I took all the rest of my decals off their backing sheets when I was getting these ready. I got a surprise as the very first one I made, with greens and metallic brown, came straight off the greaseproof paper no problem! The rest were more finicky and more brittle. (They’ve all been together in a ziplock bag). It had the Collection 2000 clear down first, which none of the others did, and then W7 spearmint. So something in that combo made it very easy to remove – possibly just leaving it so long, as the clear was very hard to remove earlier on its own. These are painted decals on a clear background, which are also rather fun to do. 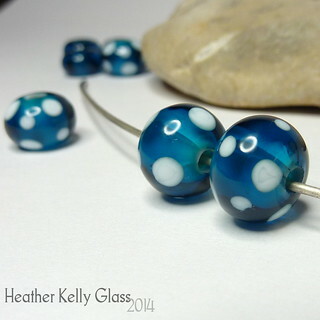 (Fear not, there will be more bead and glass posts here too! 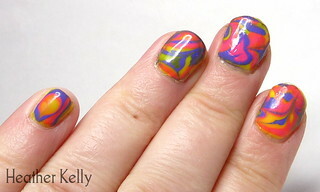 I just have a slight backlog of nail art ones I wanted to put up). 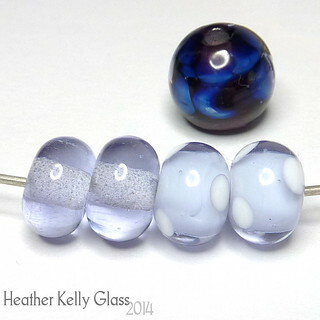 A midnight blue purple with a satiny sheen finish. 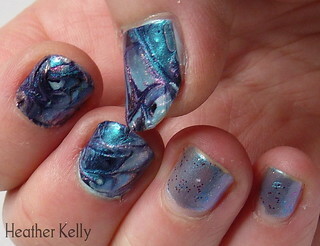 When I was wearing it as a single layer with no top coat, the satin effect was much less in evidence. Two layers and a Seche Vite topcoat, however… I like it a lot, it’s a good dark colour but with more interest than black. Yes, I got some Seche Vite. I now know exactly why so many people rave about it, and also why some people have gone off it. It sets incredibly fast, hard, and stays so shiny. No risk of sheet crinkles being impressed in your nails overnight. However, it does shrink back. You can fix that for the tips by wrapping them (putting polish along the tips first before doing the rest of the nail in stripes as usual), but I find it shrinks back from the sides and base of my nails too, leaving a ridge that you can catch in clothing and will have all your layers of polish coming off in one. It seems to very slowly shrink over time too – not so much a problem on the first day, more of one after a few days. I also got some Sally Hansen – Green Tea & Bamboo nail strengthener to use as my base coat. 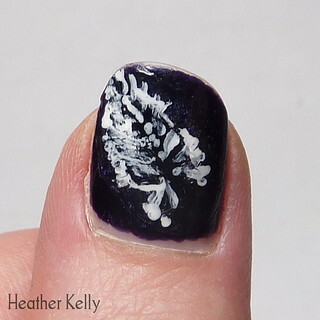 Dries a little slowly but seems to be doing good things for my nails’ growth speed and not tearing at the edges. 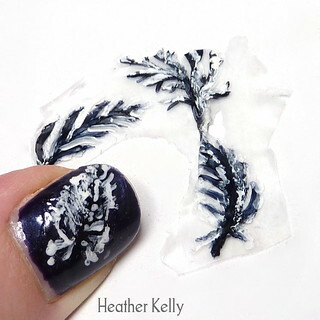 I made these feather decals with a white called High Maintenance – Milk. These are little polishes that are 2 for £1 from a local market stall and are made in China. 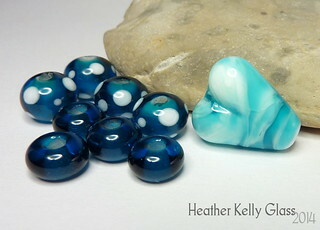 The colours vary in opacity but they have some nice bright ones. Milk worked just fine for this application, opacity very good. 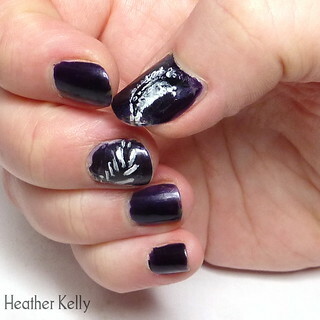 The other colour in the feathers is Payne’s Grey acrylic paint, because I have misplaced my black nail polish. I always used Payne’s Grey instead of black when painting – just preferred it. The decals have a layer of clear put down first, then I painted the feathers, then put more clear over the top. 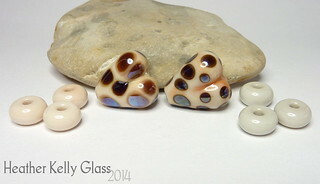 You don’t necessarily need to do that if you aren’t using any acrylics. The clear I used here was my Collection 2000 maxiflex. It isn’t a good one for doing this with as it sticks hard to the greaseproof paper and stretches rather when you try to pull it off. It also is slightly misty as a background rather than fully clear after you have done all this. These decals were made on Dec 30th and I used them on Jan 10th. The clear was getting a bit brittle by this point, but no problems using them. I just did two per hand because I hadn’t made that many, or considered the size of them at all! Bit large for the smaller nails. I think I will make a template of my nail sizes that I can put under my decals when I make them. Much easier to judge sizes that way. 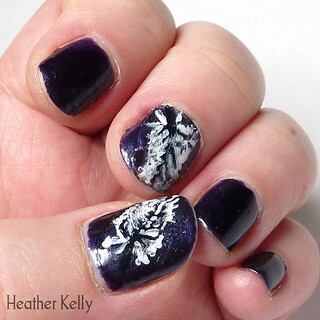 You can see the edges of the clear if the light catches them right – it’s better to leave enough clear around so that the decal can cover your whole nail even if the picture doesn’t, but I made these all squished together. Soot spirits and little white Totoros. The set over on the right were made with a different clear and done on a ziplock bag, and came off so much easier than the others. The clear stays clear too. It was Saffron’s clear, which I also got at the market stall (made in UK, you can find masses from them on eBay alongside La Femme). £1 a bottle, works so much better for this – I’ll be using that in future then! I asked for (and received!) vast quantities of new nail polishes for Christmas, since I’ve started having a go at doing nail art again. I did a little bit of multi-colour and attempted patterns some years ago, but nothing like what people are doing now! 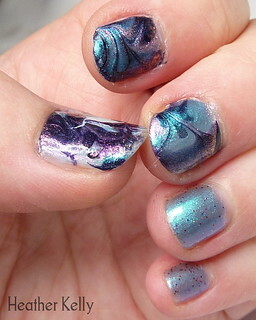 There are so many nail art blogs out there now doing amazing things – I’m only just seeing what is possible. 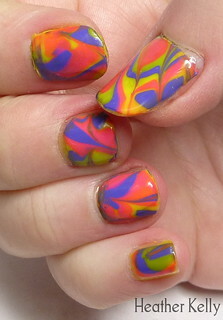 So, just before New Year, I’d read this tutorial: Dry Water Marble Nails Tutorial on Nuthin’ But A Nail Thing’s blog. 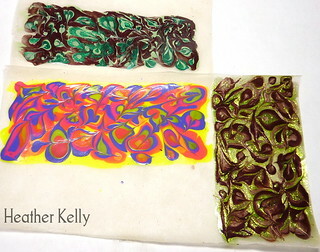 I have always loved marbled paper and this looked a lot of fun. I like the idea of making decals with nail polish that you then apply later, because that avoids having to paint left-handedly when I’m right handed. I did mine on greaseproof paper, because another blog had mentioned parchment paper being the easiest surface to get the polish off. (I think what the US calls parchment paper we call greaseproof, but no idea if theirs is thicker). Well, it will depend on the polishes, but greaseproof paper didn’t work *that* well for me – the polish comes off, but it grips quite tightly and it’s tricky to get the edges up without stretching or tearing, and greaseproof paper is very thin, so also easy to tear with tweezers. Next time I will try on ziplock bags – someone else used a sheet of acetate. 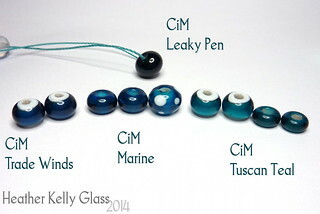 Here are the marbled decals I made, anyway! 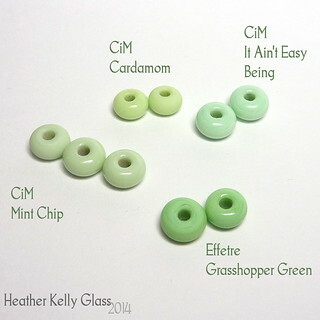 The top green and brown one was the first – I made my initial blobs a bit small on that one. I think the next two look a lot better. The neon one uses Models Own Luis Lemon (really neon yellow! 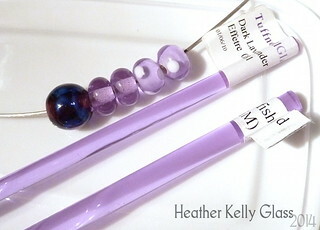 ), Pukka Purple and Dinky Pinky. 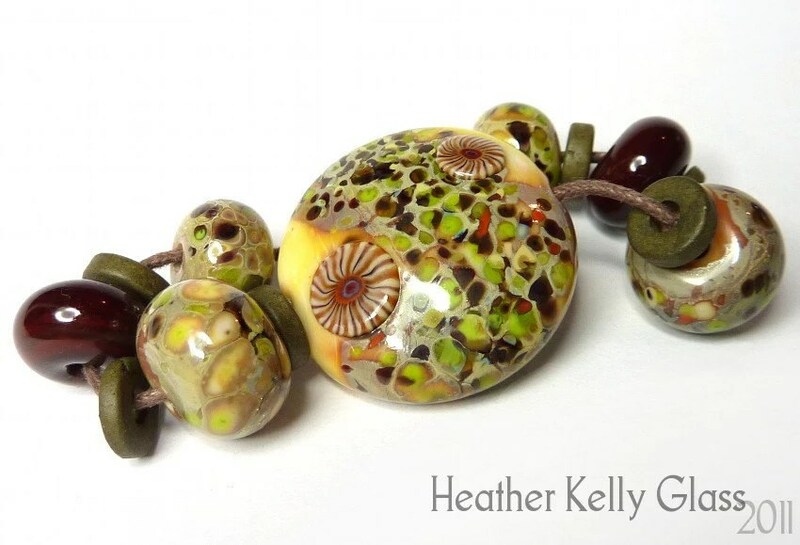 The glittery lime and brown one uses W7 Mojito and Collection 2000 maxiflex Mocha and Shiraz. 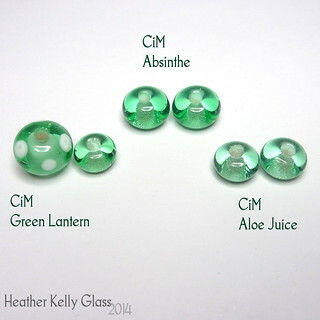 I was impressed that the mojito works as dots on top of the others – it sits perfectly well on top of them and shows up as itself. 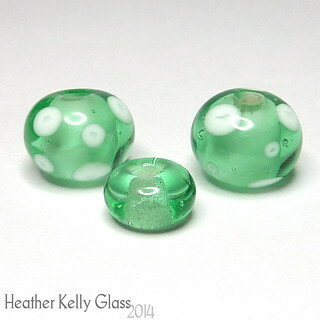 Since it’s a transparent with green glitter, I wasn’t sure if it would stay dense or not. I was really pleased with the orange one! 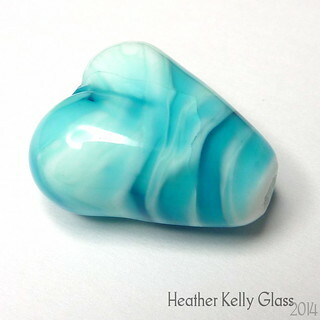 It made such smooth dots that I didn’t marble it at all since it looked great as was. It is Topshop’s Venus Fly Trap (the lime), Stage Dive (the orange) and Pillar Box (red). Many thanks to my boyfriend for venturing into Topshop to get those! I didn’t even know they did a range of nail stuff, not been in there in years. I was in two minds about the purple one – the colours bled a lot so you didn’t get clear edges, so I did fairly extreme marbling by dragging lines in all directions to get something that wasn’t too muddy. I tried using that one first, and it works really well! It was Revlon Chroma Chameleon Aquamarine, which is a colour-shifting blue to light purple metallic polish, plus Jess Moonflower and Breathless. 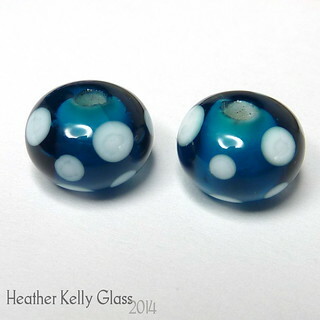 Moonflower is a midnight blue satiny colour, and Breathless is a blue-pinky holographic. Looks bluish in the bottle, made all the pink glitter in the decal. I decided to name this combo Midnight Garden because there are some decidedly foliage-like sections. 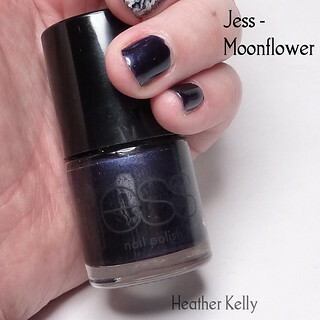 I did three nails per hand, over Collection 2000 Hot Looks Button Moon, which is a pale wintry blue. ‘Scuse edges, etc etc. Not quite at the professional finish stage yet! The other nails are two layers of the aquamarine with one layer of Miss Sporty Sparkle Touch 889, which is apparently called Amethyst Dust – no name on bottle. Small pink, blue, red, silver and amethyst glitter. One layer is just a little bit of glitter. 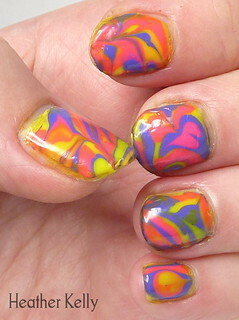 That’s what I had on before, so just left it on those nails as the base colour was the same. I don’t have any fancy top or base coats as yet, so have just been using Collection 2000’s maxiflex clear. Being flexible, it’s easily dented and doesn’t stay quite as shiny as I would like. I’m keeping the rest of the decals sealed in a ziplock bag, so they hopefully won’t get too brittle.